My father joined the Army Air Corps during World War II. He was twenty-one, from a close family in Hartford, Connecticut. When the time came for him to report for training, Thomas F. Rice, Jr. went to the Hartford train station and joined a long line of other young men, ready to board. The line was single-file, until it got to my father. His father, a Hartford police detective, was by his side, and wouldn't leave until he'd walked his son onto the train and the whistle blew. He went to Colorado Springs and trained aboard the B-24 Liberator, a heavy bomber, for one year, with a tight-knit group of men. They became crew mates and, as my father said long before the movie, closer than brothers. My father was the navigator-bombardier. 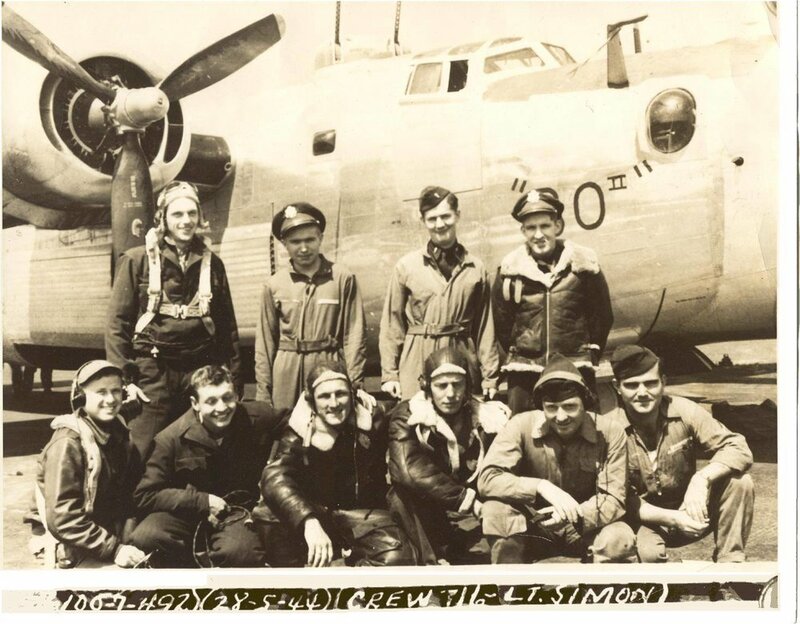 Posted to England, the Simon crew of the 492nd bomb group was stationed in North Pickenham, Norfolk, and began to fly missions. My father flew nineteen missions with the Simon crew, his "brothers," and then was reassigned to the Testa crew of the 44th. He refused to leave his old crew; his new crew had to pack him up and carry his stuff from his old Nissan hut to the new one. On their very next mission, his old crew was shot down over Heligoland, a German archipelago in the North Sea. For the rest of his life my father believed they were all killed and never stopped grieving them. It wasn't until long after he died in 1978 that I found, on the internet, information that several had been held prisoner of war and survived. If only he could have known that. The Testa crew flew a lead plane in the 44th BG of the Eighth Air Force. 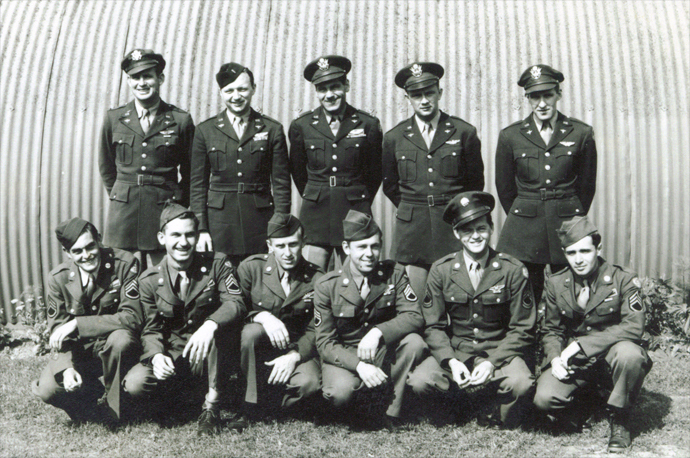 They flew many missions including providing air support on D-Day. His plane flew lead in the Battle of Dresden. My father watched planes explode in mid-air, saw his friends die in the sky. He saw the glass nose of the next plane in formation shot out, and watched as his friend, the gunner, executed a perfect nose dive into thin air. On their way back from Dresden my father's plane was shot down. He parachuted into a tree in Alsace, France, on the edge of enemy lines, earning himself membership in the Caterpillar Club. His back was broken, but he managed to cut himself down. A French family rescued him and hid him in their orchard's barn. The family had three daughters, and they gave him a bath in an apple barrel before he was moved to a battlefield hospital. Later my parents had three daughters, and I always wondered whether my father thought about that family who'd saved him. I've always wanted to find those three sisters and thank them. Like many veterans of World War II, for most of his life my father didn't talk about the war. But when he was sick and dying, and I was twenty-one, he began to tell me about what he'd seen and done. We were both night owls. He'd lie on the couch, and I'd sit in an armchair, and we couldn't see each other's eyes. The configuration was oddly like a therapist and patient. The TV was always on, tuned to Johnny Carson. Johnny's jokes and guests and Doc Severinsen's band were the soundtrack to his stories. The first stories were charming, about his leaves taken in London and Ireland. He loved both places, and talked about riding horses in Hyde Park, riding bicycles through the Irish countryside, meeting locals and swapping tales. Slowly other stories came in. He told about being in London with buzz bombs falling. Once he took refuge in a Catholic Church, and the bomb destroyed a row of houses just across the street. In 1985 when my mother came to visit while I was staying in London, the first place we went was that church. Eventually all his stories were brutal and full of loss. It's humbling to think of my twenty-one year old father plunging basically from childhood into brutal war. In the Civil War the condition was named "Soldier's Heart;" in WWI it was "Shell Shock." By WWII they called it "Battle Fatigue.” Ted O’Gorman sent me George Carlin's riff on language used to describe the effects of war. I wrote about it in The Edge of Winter. He missed his friends; it was harder to stay in touch back then, without email or websites, such as the ones created for the 492nd BG and the 44th. The bomb groups have reunions; a few years ago I attended one with the 492nd and fell in love with the men with whom my father had flown. Lieutenant John Simon, pilot of my dad’s plane in the 492nd, awarding him a medal—not sure which one. My father won the Air Medal and Distinguished Flying Cross, with oak leaf clusters and bronze stars. They are in a leather box filled with treasures: his wings, silver ID bracelet, War Department ID card, dog tags, tiny gold caterpillar pin, membership card to the Caterpillar Club, and a saint’s medal given to him by his mother and worn on every mission. I am thankful to our childhood friend Paul, retired Commander in the U.S. Navy; Gina, who served in Iraq, a reader who has become a good friend; all the service men and women I met at a fundraiser for the Bob Woodruff Foundation, helping to heal the physical and psychological wounds of war. My cousin Tom Brielmann is a is a pilot, and has for years kept the data on my father's war experience. Thanks also to Norma Beasley, for organizing the 492nd reunions, and to Paul Arnett, the 492nd historian. And thanks, especially, to my sister Maureen Rice Onorato, who remembers everything. The photo at the top shows the Simon crew, my father in the top row, far left.